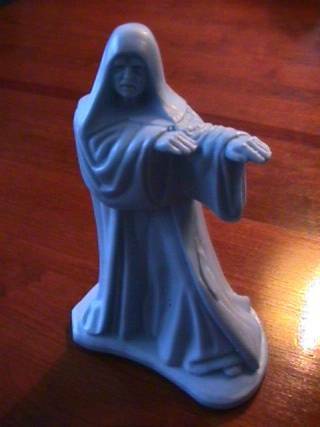 At least two Emperor figures were planned for release with the Throne Room add-on to the Death Star World series of Micro Collection playsets: a sitting one which was meant to fit snugly into a throne, and this version you see here, which shows the character positioned as if shooting lightning bolts from his hands. The Throne Room was probably planned as a rather large set, there being about 8 figures which are thought to have been in development for it. The following figures have either been confirmed as being included with the playset, or have been suggested as Throne Room figure possibilities: Emperor (sitting), Emperor (standing), Luke (probably more than one), Vader (probably more than one), Emperor's Royal Guard, Death Star Gunner, Imperial Commander and Imperial Dignitary. If you ask me, this Emperor looks a little ridiculous. He looks as though he's doing the Macarena! While this is undoubtedly a cool Micro Collection piece, it is of the utmost importance that this figure is seen and understood as a reproduction of the original prototype, and not as an actual pre-production vintage item. I have heard many excuses offered over the last few years, in attempts to legitimize these blue hardcopies, but the fact remains that they are copies of the original prototypes, and thus should be presented as such. So, if anyone offers you an elaborate story in trying to sell you one of these pieces, don't believe it, or ask around with some knowledgeable collectors prior to deciding on the purchase; its no fun getting stuck with something that you never really wanted. Of course, there are still plenty of reasons why someone would want a blue copy. If the piece is unproduced, for instance, a copy is often a very good way of procuring an example of never-made toy. The figure shown above was bought with full awareness of its origin as a copy, and that's the way it should be.